Hawaiian Airlines has revealed the next wave of culinary talent to be showcased in its ongoing Featured Chef Series, an esteemed collaboration with renowned chefs on transpacific flights that underscores Hawai‘i’s vibrant food culture and the airline’s distinct onboard experience. 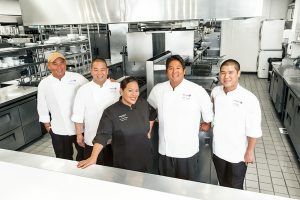 Led by Hawaiian’s newly appointed Executive Chef Lee Anne Wong of Honolulu’s Koko Head Café, the chef roster includes Mark “Gooch” Noguchi of Pili Group, Wade Ueoka of MW Restaurant, and Eric Oto of Hoku’s at The Kahala Hotel & Resort. Celebrity Chef Chang-Wook Chung of Seoul’s Kumsan Restaurant will continue to delight guests on Hawaiian’s inbound flights from South Korea with his award-winning fare. Chef Noguchi was raised in O‘ahu’s historical Mānoa Valley. He is an alumnus of the Kapi‘olani Community College’s Culinary Arts Program and the Culinary Institute of America, later working alongside James Beard Award-winning chef George Mavrothalassitis and Ed Kenney of Town Hospitality Group. Experts in Hawai‘i regional cuisine, he and his wife Amanda Corby Noguchi opened their first joint venture, Pili Group, LLC in Honolulu in 2012. Noguchi’s dedication to empowering his community through food and education has made Noguchi a recognized leader in Hawai‘i’s sustainable food movement. A selection of his in-flight creations includes Short Rib Beef Stew with Coconut Ginger Brown Rice; Mama Gooch’s Hiyashi Chuka Noodle Salad; Smoked Shrimp Dip with Crostini; Tofu Hekka with Long Rice Noodles; Portuguese Bean Soup; BBQ Pork Sliders with Hawaiian Sweet Bun; and Mushroom Frittata with Portuguese Sausage. Chef Eric Oto will lead the second phase of the Featured Chef Series for flights coming to Hawai‘i from the U.S. mainland. His passion for the culinary arts began at the age of four when he caught his first fish with a bamboo cane pole. At a young age, Oto learned the philosophies of respecting and appreciating Hawai‘i’s food ecosystem from his father, a lifelong farmer and fisherman. Today, Oto’s reverence for the ocean can be seen — and tasted — in his cooking. Committed to supporting Hawai‘i’s next generation of chefs, Oto serves as a chef-mentor for local high school students with the Hawai‘i Culinary Education Foundation and the Chaîne des Rôtisseurs Jeune Chef Competition. Chef Wade Ueoka joined Hawaiian’s culinary program in 2016 and, from Dec. 1, 2017, to May 31, 2018, designed menus for Hawaiian’s First Class guests on North America inbound flights. Beginning Sept. 1, Ueoka will design menus for Japan to Hawaii flights in all cabins. In 2013, he and his wife Michelle KarrUeoka opened their first joint venture, MW Restaurant, in Honolulu, where they specialize in Hawai‘i regional cuisine. Both have traveled the world, and draw inspiration from their journeys. In February 2014, MW Restaurant earned a James Beard Foundation nomination as Best New Restaurant. Chef Wong, a guest chef since 2015 under the airline’s former Executive Chef Chai Chaowasaree, currently oversees meals on inbound international flights. She graduated from the International Culinary Center, formerly known as the French Culinary Institute, and began her culinary training at Marcus Samuelsson’s Aquavit before playing an integral role in the opening of Jean Georges Vongrichten’s Chinese concept, Restaurant 66. Wong gained national attention when she appeared on Season One of Bravo’s flagship series “Top Chef.” She later became the series’ supervising culinary producer for the next six seasons. Former guest chefs have included Jon Matsubara, Andrew Le of The Pig & The Lady, and Sheldon Simeon of Tin Roof Maui.